Start a Stretching Program Today to Increase Your Flexibility and Fend off Sports Injuries!We live in a world where we are bound by technical comforts. We sit in front of computers all day, likely sit on our commute to work each day, and spend a great deal of time sitting during our down time watching television or reading our mobile devices. The well-motivated among us enjoy sports activities which take us from these sedentary positions and thrust us into momentary bouts of exercise and fitness. The human body was not designed for such periods of stagnation and exertion. Our ancestors were hunter gathers and spent the vast majority of their waking hours performing physically taxing tasks. Their bodies by the very nature of their existence needed to remain strong and flexible. They were in a constant state of motion so their muscles did not have time to lie dormant and tighten. Living in this modern age we do not have the same luxury.Stretching is a powerful means to bridge this gap between a forced rigid posture and our athletic endeavors. By starting to engage in a regular routine of stretching we can increase the flexibility of muscles that would otherwise be tight from long periods of sitting in our everyday lives. This is especially important for the athletes among us. Muscles that remain rigid during our work days are called upon to support our passionate sports lives, and they need to be in a constant state of flexibility for us to realize our full athletic potential. 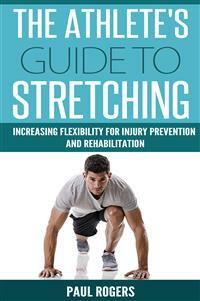 The Athlete's Guide To Stretching: Increasing Flexibility For Injury Prevention And RehabilitationThis book will outline the fundamentals of proper stretching including:- Proper Techniques for Stretching- Dynamic vs. Static Stretching- Stretching for Injury Prevention- Improving Athletic Performance Through Stretching- Things to be AvoidedOver 35 Examples of Stretches to Perform with Illustrations! We live in a world where we are bound by technical comforts. We sit in front of computers all day, likely sit on our commute to work each day, and spend a great deal of time sitting during our down time watching television or reading our mobile devices. The well-motivated among us enjoy sports activities which take us from these sedentary positions and thrust us into momentary bouts of exercise and fitness. The human body was not designed for such periods of stagnation and exertion. Our ancestors were hunter gathers and spent the vast majority of their waking hours performing physically taxing tasks. Their bodies by the very nature of their existence needed to remain strong and flexible. They were in a constant state of motion so their muscles did not have time to lie dormant and tighten. Living in this modern age we do not have the same luxury. Stretching is a beautiful means to bridge this gap between a forced rigid posture and our athletic endeavors. By starting to engage in a regular routine of stretching we can increase the flexibility of muscles that would otherwise be tight from long periods of sitting in our everyday lives. This is especially important for the athletes among us. Muscles that remain rigid during our work days are called upon to support our passionate sports lives, and they need to be in a constant state of flexibility for us to realize our full athletic potential. Besides enabling flexibility for athletic performance, stretching sport specific muscle groups will enable us to loosen tight “hot spots” and greatly lessen our likelihood for injury. One of the leading causes of sports injury is muscle imbalance and inflexibility. By supplementing our athletic activities with a regime of stretching, we are essentially cross training our sport specific muscle groups and taking responsible measures to make sure we do not land on the injured list. Beyond the sport specific advantages of stretching, we derive the added benefit of increased relaxation and stress release. When done properly, stretching is not unlike a meditative experience. It should involve slow and steady breathing techniques, and by its very nature has a calming influence on our bodies as our muscles lengthen and loosen. It is an easy way to rid ourselves of stress as we prepare for our athletic endeavors or simply unwind from a day at the office.